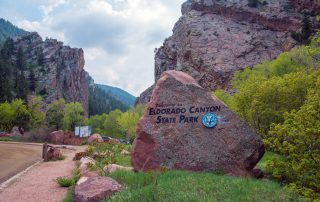 Colorado hiking and camping offers many different terrain’s and places and many other outdoors activities to satisfy any outdoor enthusiast! 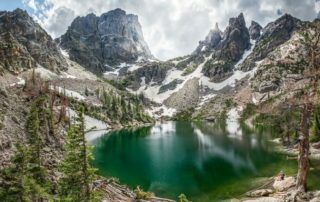 With such a diverse landscape and many other outdoor enthusiasts, Colorado has quickly become a vacation destination where people can connect with nature. 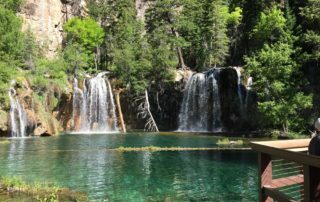 Regardless of if you are looking for a hikes and camping for one, or family activities such as whitewater rafting and panning for gold, Colorado is a great destination. Because of the outdoor culture in Colorado it ranks among the top places for the smallest obesity rate people in the United States! See the Tabs below for information related to the different climates. Colorado has a wide range of different terrains. The state is essentially half mountainous terrain and half plains which provide people interested in the outdoors with a diverse choice of landscapes to enjoy. Colorado’s elevation above sea level is 3,315 feet (1010 m) at the lowest point and 14,433 ft (4,399 m) on top of Mt. Elbert which is the highest Peak in Colorado. The drastic elevation change is due to the Rocky Mountain Range which runs North and South through the state and is also be referred to as the “Rockies”. Colorado’s elevation above sea level is 3,315 feet (1010 m) at the lowest point and 14,433 ft (4,399 m) on top of Mt. Elbert which is the highest Peak in Colorado. The drastic elevation change is due to the Rocky Mountain Range which runs North and South through the state and is also be referred to as the “Rockies”. This mountain range runs all the way from Canada to the Southern United States. 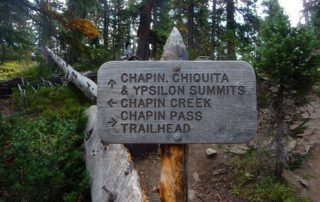 The highest points along the Rocky Mountains are referred to as the Continental Divide and can be seen or visited by many wonderful trails in Colorado. Any water falling west of the Continental Divide runs into the Pacific Ocean and any water falling east of the Continental Divide runs into the Atlantic Ocean. 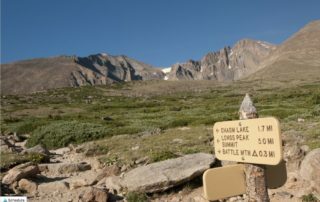 The Colorado Rocky Mountains have more 14ers then any other state in the US making it a great place to hiking 14ers. For a list of 14ers in Colorado click here. 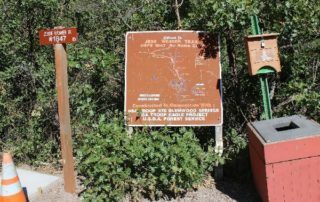 The mountains can be sparse with vegetation where you are hiking through untouched wilderness in some locations or along high plateaus with no vegetation in other areas. There are also a lot of lakes, streams and rivers in Colorado because of the diverse terrain and winter snow. Many rivers withing the US originate in Colorado. The Eastern part of Colorado resides on the Great Plains. The great plains stretch through much of the central United States and offer a great outdoor experience for anyone interested in being out on the open range. Trees are sparse in parts of the plains and packing must be done accordingly to protect against the elements such as the sun. Colorado also has a wide range of climate zones. 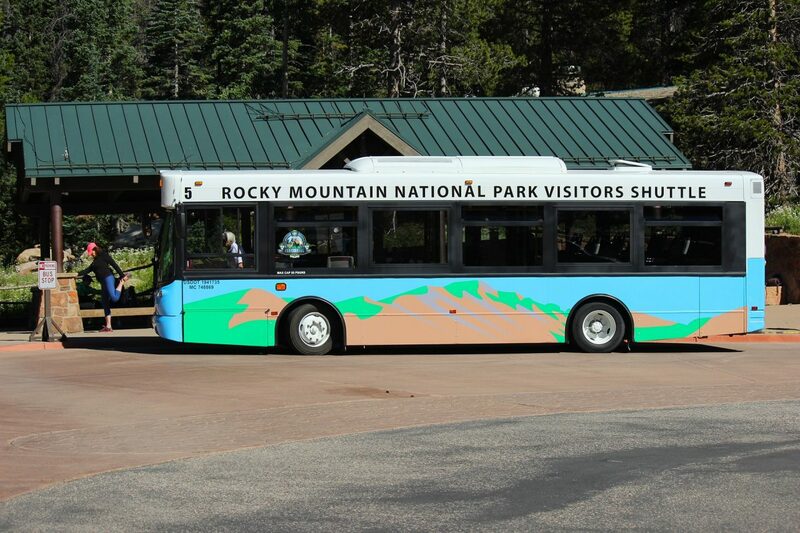 Colorado attracts many visitors due to it’s great dry climate and fewer bugs. In the Winter Colorado receives heavy snows but can still have periods of warm weather above 70°F (21°C). The summers are generally temperate but if things get hot just go up in elevation! The higher elevation areas have tundra regions where the temperatures can be low year round and in some places will have snow in all seasons. The higher elevation areas especially can vary in temperature drastically from day to night and precaution should be taken to make sure you pack accordingly. In addition the great plains can develop very strong winter and summer storms and the weather should be checked before embarking on a hike or camping trip. When hiking at high altitude or in the mountains sometimes it’s hard to see a storm just over the ridge. Also lightning strikes are common occurrence in mountains and can literally find yourself INSIDE a storm at that altitude so in general plan on summiting mountain hikes before noon. Most storms occur in the afternoon. Winds can also be very high in the mountains so take precaution and plan ahead. With the many different climate zones brings many species of animals from large to small. There are many places in Colorado where wildlife can be viewed and enjoyed readily. Colorado also contains predators so precautions should be taken to avoid any bad experiences! Colorado is a great place to view wildlife. This state contains great areas to view Deer, Elk, Bison, Antelope, Moose, and also contain may different animals which are unique to the Colorado habitat such as birds that only exist in certain portions of the state and mammals adapted to live at high altitude which can be easily viewed on many 14er hikes such as Pikas and Marmots and birds like Ptarmigans. The Colorado wildlife is also home to many different predators such as Bears, Mountain Lions, Coyotes, and Wolverines to name a few. Most predators steer clear of people. A good deterrent is to make the wild aware you are there and don’t sneak up on anything. It’s a good idea to take precaution when camping by storing your food correctly and taking some Bear spray along with you just in case. Grizzly bears have not lived in Colorado since the 1970s but smaller bears like Brown bears can still be dangerous. And as always take precaution in the spring and summer when babies are being born. Males are more aggressive during mating season but especially females can be very aggressive if they think you are threat to their babies so steer clear!